Appointments are from 8:00 a.m. to 5:00 p.m. Monday through Friday and 8:00 a.m. to 12:00 p.m. on Saturdays. Do you sell all types of auto glass or only windshields? We sell & service all the auto glass parts for your vehicle in most cases: Door, Vent, Quarter, truck sliders or Back. Since 1991, Glass Works is a local, family owned and operated, proudly serving Tulsa and the surrounding areas. Yes, all of our glass technicians have passed certification tests and are thoroughly trained to ensure your vehicle's glass is properly repaired. You are serviced by professionals who take their job seriously. For your convenience, we offer mobile service in Tulsa and surrounding areas. Serving the Tulsa, Bixby, Broken Arrow, Catoosa, Claremore, Collinsville, Coweta, Glenpool, Jenks, Kiefer, Verdigris, Owasso, Prattville, Sperry, Sand Springs & Sapulpa areas. We will come to your home, office or wherever your travels take you. Does Glass Works Auto Glass only work on passenger vehicles? No. Glass Works Auto Glass also works on heavy equipment, trucks, and other specialty vehicles. Does Glass Works offer fleet discounts? Yes. Please contact one of our glass representatives for more information on fleet discounts. YES. All work comes with a WRITTEN LIFETIME warranty against manufacture defects, leaks, and workmanship for as long as you own your vehicle. (Pre-existing rust or body damage void this guarantee) Please refer to our warranty page. Our warranty comes with every piece of glass installed, at no additional cost!!! Since 1991 Glass Works is committed to providing the best auto glass value, the highest quality of workmanship, parts, and customer service. Glass Works meets a set of criteria developed to ensure both safety and quality. Our installers completed a certification process in the proper use of adhesives. These adhesives are what holds windshields in place and is the single most critical element in a safe, secure installation. 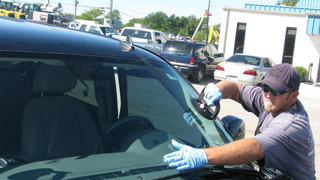 We service the auto glass need of several local car dealerships. Please feel free to contact our references and the Better Business Bureau. http://tulsa.bbb.org/. Are there differences in the quality of glass? There are over 100 manufacturers of glass and quality does very. Most insurance companies are working closely with one specific auto glass manufacturer who also provide claims services for the insurance industry. One interesting thing about the network model the insurance industry has adapted to is that they use Safelite auto glass, which is not used by the automobile manufacturers. Most cars that come off the assembly line use brands like PPG, Carlite, LOF-Pilkington and various others. OEM stands for Original Equipment Manufacture. This means that the glass meets the original specifications for safety and quality as the glass that it came with from the factory. Some OEM brands are PPG, Carlite, LOF-Pilkington and various others. The best way to assure exact fit is to use a windshield produced from a fixture engineered to manufacturer’s specifications. OEM glass is your assurance that this has occurred. Okay, I'm ready to have my glass fixed, how do I schedule an appointment? Its easy, just one call and one our friendly glass specialist will help you in scheduling an appointment and answer any questions you may have. Your quote includes the cost of the glass and labor. Local and state taxes, as well as any required moldings, may be an additional charge. How soon can Glass Works Auto Glass repair or replace my auto glass? We understand how important it is to get your auto glass needs met quickly. We will do our best to work with your schedule and circumstances. In most cases Glass Works Auto Glass can repair or replace your auto glass within 24 hours of your call depending on the part location and the time your order is placed. However, it is our intent to provide each customer with same day service if needed. Glass Works Auto Glass can replace most windshields in less than 1 hour with a safe drive time of 1-3 hours from the time of completion (varies with humidity, temperature, and type of urethane) after the installation is complete to ensure proper curing of the urethane seal.. Your technician can provide the best estimate of a safe drive-away time on the day of your installation, based on current conditions and materials used. Can you replace my windshield or auto glass during inclement weather? In order to provide mobile auto glass service during inclement weather, we will need suitable shelter (such as a carport, garage, parking garage, etc.) from precipitation. If shelter is unavailable at your location on a rainy/snowy day, we will gladly re-schedule to meet at our shop or a new mobile appointment for a more appropriate time. Can I replace my windshield in the winter? Yes. Glass Works Auto Glass has invested in a urethane that is safe to use down to zero degrees with a one hour safe drive time. Will the technician transfer my rearview mirror it to the new windshield? Yes, our technicians will transfer your rear view mirror to your new windshield. Our technicians will vacuum any glass pieces found & accessible in your vehicle's doors as a result of glass breakage. You don’t have to wait with your vehicle; depending on the repair we may need to have access to your vehicle keys. Windshield chips or breaks that are not in driver's view and smaller than a quarter in most cases the windshield can be repaired, instead of replaced. For best results, contact us as soon as you notice damage so the windshield can be repaired before the damage spreads. How is the windshield repair done? Our specially designed tool removes the air and injects resin into the break a windshield repair is a that involves cleaning and treating the damage with specially designed resins and tools. In many cases, the damage can be repaired by one of our trained technicians in less than 30 minutes. You have the right to choose which auto glass shop replaces your glass. Some insurance companies may try to get you to go to one of their "preferred shops" (a practice known as "Job Steering") rather than encouraging you to go to whichever shop you'd like. Job steering is not only illegal, but it usually is a recipe for a bad experience for the vehicle owner. When glass shops get work from job steering, their goal is to keep the customer happy, which in these cases is the insurance company. Will my insurance company pay for my new windshield repair? Yes, if you have full coverage (comprehensive). Your only out of pocket expense is your comprehensive deductible, which in most cases is $0-$100. If you think your deductible is higher than $100, be sure to confirm that you are not confusing your “collision” deductible with your “comprehensive” deductible, as collision deductibles are usually higher, but not applicable to windshield repair or replacement. We work with all insurance companies handle the paper work, billing your insurance company directly. We can call in the claim for you and assist you with setting up a claim. You pay only your deductible. In some cases, we can save you money off of your deductible. See our insurance specials! Will my insurance rates go up if I get my auto glass or windshield replaced through my insurance? No. Auto Glass and Windshield replacement falls under the comprehensive portion of your insurance rather than the collision portion. Broken auto glass does not reflect your driving ability and has no bearing on your level of risk to the insurance company. Therefore the repair or replacement of your windshield will not influence your insurance premiums. I have a crack or a ding in my windshield - is it really important that I fix it right away? 1. 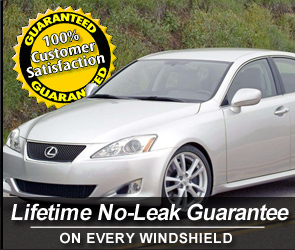 Rock chips are the leading cause of cracked out windshields. Extreme OK weather changes in temperature cause the glass to contract and expand causing rock chips to spread. The longer you wait the more moisture, dirt and debris will collect in the break - and the more likely the break will spread. Glass Works can repair the break before the damage spreads and makes a windshield replacement necessary. 2. For your safety. The windshield is more than just a "shield" from wind and road dirt, it's an important structural element of your car. It helps keep you and your passengers in the car in a front impact accident, and keeps your car's airbag in the optimum position so it can function as designed. A weakened windshield can be dangerous to you and your passengers in the event of an accident. Also, damaged glass may cause optical impediments when driving, particularly at night, which is a significant safety hazard.